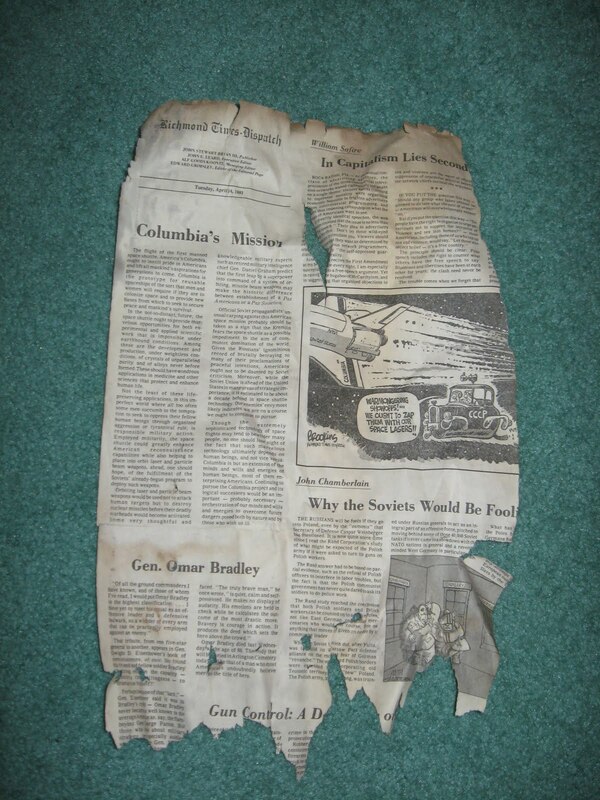 Home » history , mysteries , newspapers , richmond times dispatch , soviet union , space shuttle » How did a thirty-year old scrap of Richmond newspaper get into my driveway? How did a thirty-year old scrap of Richmond newspaper get into my driveway? Saturday afternoon my girlfriend arrived at my house. It's about a hundred miles or so between where we live (only an hour and a half of drive time, and less if the Virginia state troopers aren't looking :-P). She came at 2 and we were hanging out here when a short while later in the afternoon we noticed something on the front bumper of her car. At first we thought it might be part of some animal that she had hit (though she couldn't remember ever hitting one, which is better than can be said about Yours Truly, but anyhoo...) But when we went out to look at it, it wasn't long before we had wished that it was a piece of roadkill, 'cuz we can not figure out how this ended up stuck in her car's bumper and then survived the trip down here. That's a photo of it. "It" being a scrap of newspaper from the Richmond Times-Dispatch. And from the April 14th, 1981 edition of the Richmond Times-Dispatch at that. How does a piece of newspaper from thirty years ago make a few hundred miles' worth of journey across the state of Virginia and along the highway to arrive at my house in north-central North Carolina, and not only that but in remarkably intact and un-faded condition? But that's not the craziest thing that we found about this newspaper fragment. It's from the op-ed section. The lead editorial is an essay about the space shuttle Columbia. The Columbia launched on the very first space shuttle mission, a test flight, on April 12th 1981. It landed a few hours after this edition of the Richmond Times-Dispatch was published. Just over thirty years later, this piece of newspaper with the complete essay about the first shuttle flight arrived in my driveway, a day after the orbiter Atlantis launched the very last space shuttle mission. Quite the peculiar coincidence, aye? There are numerous other aspects of this piece of newspaper that make it quite fascinating. A column by William Safire (who died in 2009) addresses the role of the marketplace in the freedom of speech. Below that is an editorial cartoon about the Columbia launch, poking fun at the Soviet space program (note the "CCCP" Cyrillic initials for the Union of Soviet Socialist Republics) evokeing especially strong reminiscing of those days when we were still embroiled in the Cold War. Nestled between that and another cartoon - an incomplete one about the Warsaw Pact - is an essay by one John Chamberlain warning why Russia would be making a mistake to intervene in Poland's Solidarity movement (Caspar Weinberger, Secretary of Defense under President Reagan, is noted). At the very bottom of the page is the start of a piece about gun control. Still another piece notes the passing at age 88 of General Omar Bradley: one of the United States' most honored commanders of the Allied Expeditionary Force during World War II. The reverse side of the Times-Dispatch page is no less intriguing, despite it being filled with nothing but advertising. The most interesting interesting is an ad for Radio Shack's TRS-80 home computer: you can buy a TRS-80 with built-in 12" monitor, two 5 1/4" floppy drives and expandable to 48K of memory... all starting at just $999! The ad also makes sure to inform you that Radio Shack has other TRS-80 computers priced between $249 to $10,000. ...and how did it come to be stuck in the front bumper of my girlfriend's car? We haven't a clue. But it is quite the neat mystery! Maybe someone reading this can suggest a hypothesis for how it came to be here, 'cuz I'm all out of ideas. My theory. Kristen must have hit 88 mph while Va.'s finest weren't looking, went back in time to April 14, 1981, startled someone with a Times-Dispatch, hit 88 mph again to arrive back to the future in your drive way with the paper pressed against the bumper. I think Chad is on to something. I always thought Honda was the kind of company to start sneaking experimental technology into their cars without the owners knowing it. The Radio Shack TRS-80 was colloquially known as the 'Trash-80,' and was incapable of using or displaying lowercase letters. The keyboard was roundly disliked because it tended to register single-presses as double- or triple-presses. You could solder a memory chip onto the system board to make it handle lowercase letters, which was a popular aftermarket hack. You know how you wrap breakable items before storing or moving them? I propose some items were wrapped up 30 years ago. Then this box of stuff was moved recently on the back of a pickup, which then released said page into the wild...er bumper.